The University of Colorado and Colorado State University face off tonight in Denver for the 90th “Rocky Mountain Showdown.” It’s time to Get More Smarter. If you think we missed something important, please include the link in the comments below (here’s a good example). If you are more of a visual learner, check out The Get More Smarter Show. Read that last one again: Nearly HALF of Americans think Congress should being impeachment proceedings. That’s pretty astonishing. ► Former Arizona Sen. John McCain is being honored in Washington D.C. ahead of burial services on Saturday. McCain’s body is lying in state under the Capitol rotunda today. If you want Coffman to support your position, generally you just need to wait a few months. Meanwhile, Congressional Republican leaders are getting close to a self-imposed deadline to abandon underperforming incumbents who look likely to lose to Democrats in November. Coffman is probably not at risk of being cut off by the National Republican Congressional Committee (NRCC), but 2018 is shaping up to be a strange cycle. ► If you think Republican Attorney General candidate George Brauchler might be ready to tackle the issue of opioid abuse, you might want to check these campaign finance reports. ► You know your campaign for Governor is struggling when fact-checks about opposition ads just kinda make things worse. Sad trombone for Walker Stapleton. Elsewhere, CBS4 Denver fact-checks a negative ad targeting Democratic Congressional candidate Jason Crow in CO-6. The verdict: It doesn’t check out so good. ► President Trump is long past pretending that he might fire Attorney General Jeff Sessions. Rep. Elijah E. Cummings (D-Md. ), ranking Democrat on the Oversight and Government Reform Committee, and his counterpart on the Judiciary Committee, Rep. Jerrold Nadler (D-N.Y.), also accused Republicans of “cherry-picking” portions of emails and text messages between former British spy Christopher Steele and Justice Department official Bruce Ohr to bolster a narrative that they were part of a conspiracy to undermine the Trump campaign in 2016. …During the course of the eight-hour interview, the lawmakers “repeatedly referenced, read out loud from, and asked the witness questions” about the documents, which had never officially been provided to the two committees, the Democrats wrote. So. The President of the United States is alleging, with no proof, that TV cameras are faking technical difficulties when he starts talking about “fake news.” Which is weird, because I watched him say this line on TV last night. A real quote from the President of the United States. ► Senator Cory Gardner (R-Yuma) says that he thinks President Trump will stay away from trying to kneecap Colorado’s legal marijuana industry. That’s probably not a good sign for supporters of Colorado’s legal marijuana industry. U.S. Sen. Michael Bennet on Thursday sent a scathing letter to the White House’s Office of National Drug Control Policy urging the administration to reconsider its quest to gather negative data about legal marijuana programs, like the one in Colorado. …The Trump administration’s dealings with marijuana and the Colorado congressional delegation’s involvement in trying to protect the state’s recreational and medical programs has been an ongoing saga since U.S. Attorney General Jeff Sessions rescinded the Cole Memo in January. ► Congressman Doug Lamborn has never been one to tackle subjects that are actually relevant to his office, so this isn’t really a surprise. The Trump administration is rolling back some U.S. regulations on climate-changing methane pollution, calling them expensive and burdensome, but Colorado says its rules are working — and they have industry support. …Colorado, the fifth-largest natural gas producer in the nation, started requiring energy companies to regularly inspect oil field equipment for leaks in 2014. The program is designed to reduce releases of methane and volatile organic compounds, or VOCs, which are also components of natural gas. Rep. Barbara Comstock (R-Va.), an endangered GOP incumbent in the House, said she would work to reverse the pay freeze. Trump says that he is cancelling the pay raises because of the “nation’s fiscal situation,” though this wasn’t much of a concern when Congressional Republicans rammed through a tax cut for rich people last December. ► Secretary of Defense James Mattis could be the next member of Trump’s cabinet to be forced out of his job. ► The Notorious RBG has become one of the most prominent faces of the Trump resistance. ► Republican gubernatorial candidate Walker Stapleton made a tortured and ill-informed analogy about Congressman John Lewis in discussing his great-grandfather Ben Stapleton. ► Republicans are apparently leaking sensitive security clearance forms in an effort to damage at least one Democratic Congressional candidate. ► Looking for information on how your state lawmaker represents progressive ideals? Then this is for you. 538: How Much Trouble is Ted Cruz Really In? A darn good analysis story. No hyperbole, good historical context about polling this far out, and a clear conclusion. 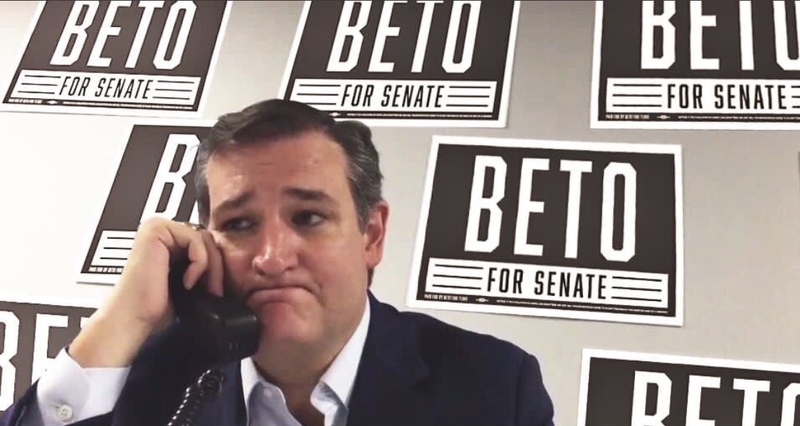 Essentially, it does not look good, but it is very early and election day could be anywhere from, "Cruz winning by 11 points to O’Rourke winning by 5." Enough to give hope to Democrats while being very realistic that Cruz is ahead and no poll has yet shown him behind. Not nearly as much as I would like him to be in. Surely we can coax Nutter into endorsing the Canadian-born Rafael Edward? The surest kiss-of-death for any candidate? It isn’t like he’s a virgin for Rafael’s causes. Are they going to roll out the crazy father? Too soon? Or now that he doesn’t have an Obama foil maybe he’s been put out to pasture? Maybe the father is keeping a low profile so as not to attract the attention of the National Enquirer. I wonder if they have the goods on Papa Cruz inside that safe that holds all Trump and Cohen's secrets. Inquiring minds want to know…..
Was You-Know-Who asked to stay away from the Aretha Franklin funeral, too? Governor Polis, please make us more like California! The bill would prohibit Internet service providers from blocking or throttling lawful traffic, and from requiring fees from websites or online services to deliver or prioritize their traffic to consumers. The bill also imposes limits on data cap exemptions (so-called "zero-rating") and says that ISPs may not attempt to evade net neutrality protections by slowing down traffic at network interconnection points.